The labyrinth at Trinity Episcopal Church, where I sometimes go to find inner peace. My husband will be very happy to see I’m admitting this in public. I have a hard time saying I’m sorry when it comes to an argument. It’s not that I don’t think I’ve done anything wrong. I’m a firm believer that both sides have usually fallen into some form of error when embroiled in an argument – if not from the outset, most definitely once the battle begins. And it’s not even that I don’t feel sorry for something along the way. At the very least, even when I feel like I’m 100% correct in my original point of contention, I’m always sorry we’re fighting. And I’m sorry the other person has been hurt in the process of airing out our grievances. Here’s where my hang-up with “sorry” comes in: I can’t stand the thought of it being issued prematurely. I refuse to make an apology until I feel like my voice has been heard. I dislike the idea of a peace treaty that comes from either of us not having said what we’re really thinking and feeling. For me, a peace that stems from sugar coating or backing down from a perceived truth is only temporary. The issue will inevitably come up again because root issues were never really resolved. I share all of this, not because I think I’m right or justified in this approach to conflict mediation. Rather, I put all this out on the table as an introduction to processing the quote from Jean Vanier. 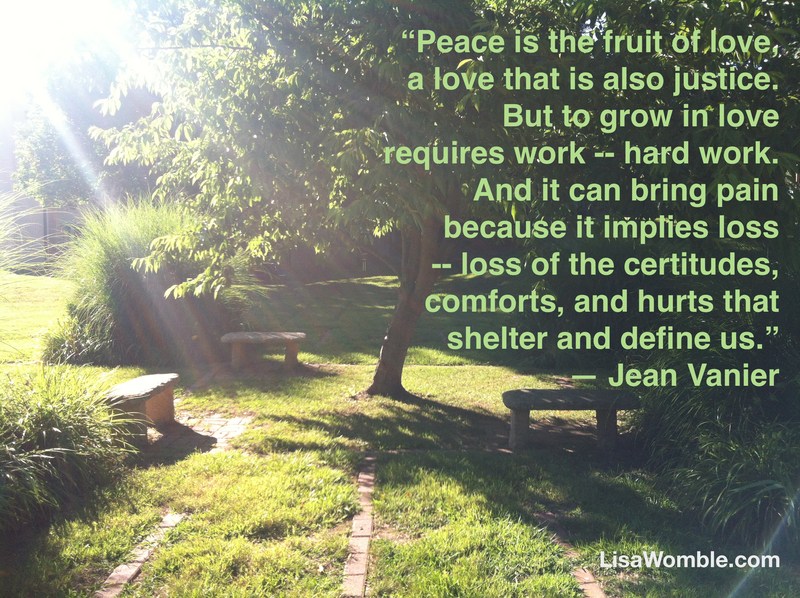 Here, I will share how I am working through the challenges presented in the quote, with the hope that the lessons I’m learning will also be seen as applicable to those who are praying for peace and justice in Ferguson, Missouri and beyond. Contemplating the loss of certitudes – Am I willing to admit I may be wrong? If I am, then the resulting action would be to listen more closely to the person on the other side of the debate. Instead of only listening for signs that they hear my point of view, I will listen more closely to theirs. What hurts are they expressing? What feels like injustice to them? What valid points are they bringing to the table? Instead of only seeking to be understood, perhaps I should ask questions about their history and what has led them to the conclusions they are expressing. Contemplating the loss of hurts that shelter and define me – As difficult as that last area of contemplation was for me, this one is even harder. Am I willing to let go of my hurts? Holding on to my hurts shelters me from being hurt again. Will I risk all that in order to restore relationship? How does my hurt define me? Not just this hurt, but all the past hurts that feel similar to this one. Is it fair to bring all that baggage into this current conversation? It seems reasonable to allow both sides to acknowledge those hurts as reasons for their current stance on the issue and to promote understanding. If, however, I’m unwilling to release my grasp on those hurts … well, then I’m still in self-preservation mode and not yet working towards relationship preservation. “Peace is the fruit of love, a love that is also justice.” In seeking peace and justice, which of the losses is hardest for you to take?